After working with our good friends at Border City Wrestling for years marketing for their sold out wrestling events, we finally put our foot down and force them to let us build them a website. 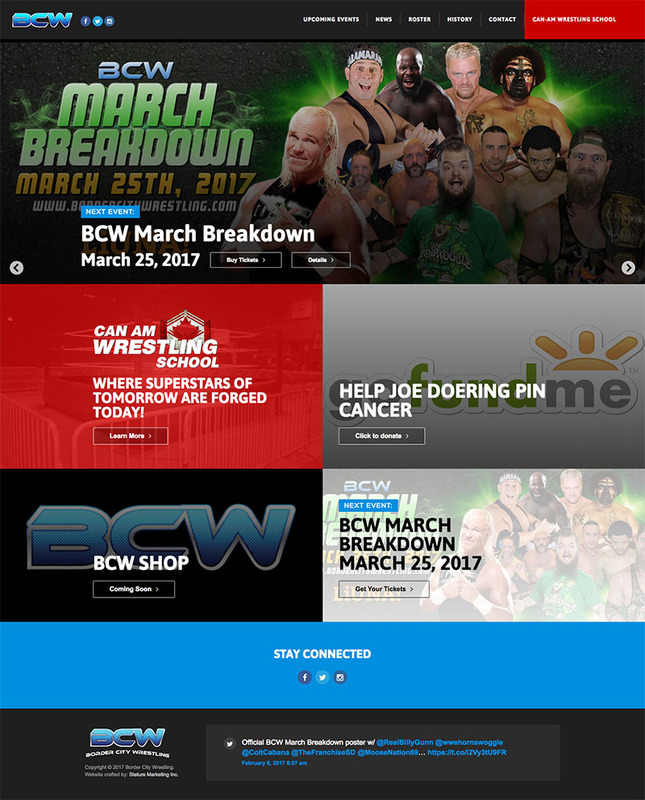 They have fans all over the world, and Facebook was just not enough, we wanted to showcase the BCW brand through a custom website. We knew BCW would benefit from having a website, but also knew they were technology challenged, and there was a good chance a complicated website would never be put to use and become outdated immediately. So, we had to put together a strategy that would give them the power to achieve the main business goals with a very straight-forward administration experience. We built the BCW website on the WordPress platform. We slimmed down the admin dashboard, removing all unnecessary pages and settings so there were no distractions or risks of breaking stuff. The website incorporated News (blog), Events, and Roster custom post types where each content item can be individually managed. Using custom fields, the administrator can easily add and manage the unique content. The homepage is completely dynamic and controlled via one settings page. A single custom page template automatically chooses the appropriate layout based on the content and options used. The team at BCW was thrilled with how easy the website is to use and how much control they have over each page and type of content. They were blown away with how thoughtful and dedicated Stature Marketing was to helping solve a business problem that has always been a challenge for the company.